On April 26th 2018 Waterloo Region Home Builders Association presented the 22th Annual SAM Awards recognizing the highest levels of achievement in the residential development and construction industry. WINNER AWARD: “Most Outstanding Two Storey Design (in a home up to 2,500 sq.ft.) 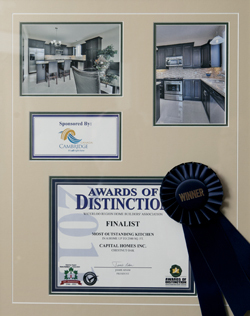 "
On November 5th 2015 Waterloo Region Home Builders Association presented the 20th Annual SAM Awards recognizing the highest levels of achievement in the residential development and construction industry. WINNER AWARD : “Most Outstanding Kitchen (in a Home over 3,000 sq.ft.) 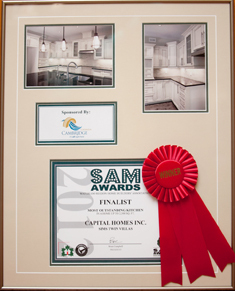 "
On November 8th 2013 Waterloo Region Home Builders Association presented the 18th Annual SAM Awards recognizing the highest levels of achievement in the residential development and construction industry. FINALIST AWARD: “ Most Oustanding Multi-unit Design (up to 2,000 sq.ft.) 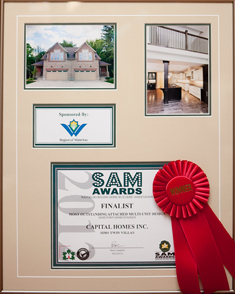 "
FINALIST AWARD: “ Builder of the Year, Multi-Unit Home "
On November 9th 2012, WRHBA celebrated its 17th anniversary of the “SAM Awards”. This event recognizes the Companies which best exemplify the highest level of accomplishment in the home building industry. WINNER AWARD : “Most Outstanding Multi-Unit Design”. WINNER AWARD : “Most Outstanding Kitchen (in a home up to 2,500 sq.ft)”. 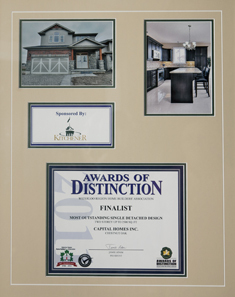 FINALIST AWARD: “ Most Outstanding Single Detached Design (up to 2,500 sq.ft.)”. FINALIST AWARD: “Builder of the Year, Multi Unit Home”. These awards are given to the Builder that, amongst other things, shows a high degree of innovation in the production and quality of its products.. WINNER AWARD : “Most Outstanding Kitchen (in a home under 2,500 sq.ft)”. FINALIST AWARD: “ Most Oustanding Floor Design (in a home under 2,500 sq.ft)”.